Your skin in winter may be subjected to severe stress due to biting cold temperatures that lead to dry, pale skin. You may even suffer from small traumas or abrasions due to the fluctuating temperature changes, especially detrimental to sensitive skin. Intervene during the winter months with special treatments and good daily habits to protect your skin as much as possible from this harsh season. Make sure you concentrate on hydrating it, nourishing it and creating a real anti-winter shield. 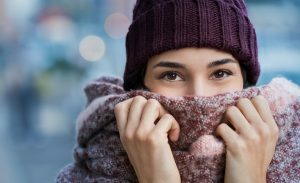 Moisturize: Despite scarves and hats, which in winter, almost all of us have a habit of wearing, the face is always rather exposed to the cold of winter and this has obvious consequences. It would be important to prepare the skin for the harsh winter temperatures, moisturizing it daily throughout the year, and periodically pampering it with masks and treatments for reconstruction and epidermal regeneration. If, however, once winter arrives, you should find yourself unprepared, no problem, there are remedies to take care of and protect your face. During the winter our skin requires more care and attention, especially if it already presents itself as a dry, cracking skin. Make sure you nourish sensitive skin of the face and body with ecological and safe products, starting with moisturizing creams and natural remedies that include using aloe vera gel or shea butter to soothe chapped or reddened skin and rough skin. Have a look at these organic moisturizers! Exfoliate: Avoid aggressive detergents and too cold or too hot water. If the skin of your face and body tends to be dry and cracked, remember to put into practice some important precautions: wash with warm water and mild detergents, from time to time exfoliate the skin with a natural homemade scrub, and choose a natural make-up remover in order to not irritate your already sensitive skin. Remember also that winter leaves many toxins in the body that fill the skin with impurities, causing it to lose tone and brightness. If there was ever a time to splurge on beauty treatments to nourish your skin, Winter is definitely the season of choice! Protect: Incorporate remedies to protect your lips from the cold, and use the same strategy to take care of them when they are dry and chapped. Natural remedies to protect your lips from the cold include ecological and do-it-yourself lip balms and shea butter, a truly irreplaceable multi-purpose remedy in winter. Check out this blog of 12 Tried and Tested Treatments for Chapped Lips by Balance Me Beautiful filled with DIY solutions to treat dry, cracked lips! Make sure you also protect your hands from the cold. Your hands are usually your most exposed body parts to the winter cold, because to keep your hands free for cell phone use, you often give up your gloves. This bad habit almost always leads the skin to crack, so it is extremely important to care for your hands. Another factor to consider in protecting sensitive skin, is the heating temperature in your home. You can protect yourself from the cold, but make sure you do not exaggerate with the temperature of your home heating systems. Your house should not be transformed into a tropical island to escape from the cold. Remember that excessively high and dry temperatures ruin skin and hair. Even the lips are affected and your eyes may start to redden and itch. Make sure your home temperature does not exceed 70 degrees.